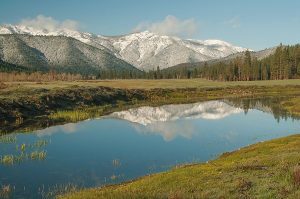 Spring Snow, Grizzly Ridge, Heart K Ranch Pond, Upper Genesee Valley, Sierra Nevada, California, 2015 by David Leland Hyde. Environmentalists often assume the worst about the people involved in a given situation, who may not be maliciously destructive of nature, but may inadvertently be having an adverse effect. Environmentalists come into scenarios operating only out of their own mindset, rather than seeing others’ views, or going to where the people are who are involved. They believe all wealthy people are evil and judge people by net worth. They judge people by good intentions and words, rather than actions. Rather than trying to understand other’s backgrounds in a situation and being tolerant of others’ knowledge or lack of knowledge of ecology and natural systems, they put people down who do things differently. They forget that we are all learning how to be more Earth-friendly. The minute they purchase a hybrid vehicle or other green technology, they immediately start confronting and putting down those who are still using older, less efficient or less effective products or methods. They believe high tech is automatically bad for the environment. They start interactions attacking and confronting, with an “us versus them” mindset, rather than listening and gathering information about people’s motivations and goals before addressing them. They assume that an enemy of a friend is always an enemy. They assume that a friend of an enemy is always an enemy. They assume that a friend who disagrees with their viewpoint then becomes an enemy. They assume all Capitalists, all Republicans, all religious people, or all of the people from any given group are the enemy of preserving nature. They use fear as their primary tool to move people. They paint doom and gloom scenarios, cite perilous natural events, natural disasters and distressing statistics to scare people into decreasing their environmental impact. Educating the public about pending catastrophe or warning of dire circumstances is important and necessary to keep people informed, but over and over tests and studies have shown that used as the primary persuasion method, fear can be paralyzing and discouraging, or easily ignored while people and corporations continue destructive business as usual. They attack environmentally destructive organizations and corporations from the outside, rather than infiltrating, educating and changing them from the inside. A few of them chose to remain ignorant of the law, believe it does not apply to them, but generally believe that through mere force of thinking they are right, they can bend the law or obtain exceptions. They believe that justice and what they think is right prevails in court, rather than existing laws. They believe that hiring good lawyers means they will win, even if they are wrong or in violation of the law. Some of them believe that all good lawyers are infallible, always tell the truth, never oversell, do not mislead, and will not lead them astray. They believe that environmental issues are policy problems, rather than problems in thinking and consciousness. They think that if they disagree with a legal definition, all they have to do is dredge up a definition by a source that is more in line with their own idea of the definition and the legal definition will no longer apply. As an example of just one major issue, environmentalists and the major environmental groups, have largely failed to convince individuals, companies and governments both large and small to take enough significant, consistent action to thwart the increasing pace of climate change. We have also failed to instigate sweeping changes that could protect water supplies into the future and have also been ineffective in slowing down the mass extinction of species that has been escalating for the last 100 years. Most environmentalists have refused to make any major changes personally that would lead to a smaller carbon footprint. People say they are afraid to go back to caveman days.” However, Naomi Klein in This Changes Everything said we would only need to go back to the living standards of the 1970s to avert the worst effects of climate change. Yet we perpetuate the illusion that we can continue to live much as we always have and not change any of our wasteful or bad habits, but rather avoid our own destruction merely by changing energy sources. Meanwhile, most of us keep blaming the problem on other people, the government and any other scapegoats we can find. For example, I know people who condemn their wealthy neighbors for using a helicopter for transportation, while they themselves do a tremendous and far above average amount of driving per year just so that they can live far out on the edge of a wilderness surrounded by vast forests and an almost pristine valley, while also working in the nearest major city to earn a higher income. One major mistake these seven neighbors, who call themselves the Genesee Friends, made in Genesee Valley in relation to the helicopter, besides espousing many fallacies and made up arguments with little to no factual basis, they failed to obtain the support of the majority of people in the area before launching an activist campaign. By far the majority of neighbors stand with the helicopter owners and their sustainable ranching, historical restoration and philanthropy benefitting local organizations. The Genesee Friends also mistakenly claimed to represent all of us in the entire Genesee area, while also attacking anyone who disagrees with them. Even more troubling, like the worst of environmentalists, this small minority of people give activism itself a bad name. When my father, pioneer photographer Philip Hyde and his associates: Ansel Adams, Eliot Porter, David Brower, Howard Zahniser, Olas and Margaret Murie, Martin Litton and many others set out to make the many national parks they did in the 1960s and 1970s, when they embarked on a major campaign, they made sure they had the support from the majority of the public, or a definite plan to obtain it. Not only were the national park projects more popular than the projects to exploit the resources in the places in question, but the popularity of the parks has only increased over time. Meanwhile, the few so-called activists in Genesee only render themselves less and less popular all the time. More on this in future blog posts and in my article linked to below. Over the last two years I went through an unusual experience that has changed my perspective on who protects the environment and who impacts it adversely. Leading up to this experience and affecting how I perceived it tremendously, in 2015, I traveled to the Midwest to photograph what is left of traditional small farming. I went to the heart of the country to take its pulse and capture it as it is because I discovered that industrial agriculture has taken over. Old historic barns, equipment and methods are going fast. With the rise of industrial agriculture, our factory farms have drained our aquifers, lakes and rivers down to dangerous levels, turned many small farming settlements that thrived for 100-150 years into ghost towns and transformed our farms from one family operations into colossal corporate giants sustained by heavy doses of deadly chemical spraying and cancer-causing genetically modified crops. When I came home from the Midwest, the unusual experience of having one of the one percent most wealthy families move into my neighborhood changed my life forever yet again. In the print newspaper and online version of my article, “In Defense of the Palmaz Family and Genesee Valley Ranch,” I explain in more detail how I came to support this well to do family and stand behind their sustainable agricultural practices, organic farming and restoration of the old barns and other buildings of our local Genesee Valley Ranch, rather than siding with a small minority faction of my neighbors who have tried and failed to obstruct, ostracize and turn public opinion against the Palmaz Family. Fortunately for our county and for the welfare of Genesee Valley, the family’s kindness, good character and generous philanthropy in our community won over most of my neighbors and the majority of people in surrounding towns. I wrote the article originally for the weekly “Where I Stand” column on the opinion page of the local newspapers printed by Feather Publishing including the Feather River Bulletin, Lassen County Times, Chester Progressive, Portola Reporter, Indian Valley Record, Westwood Pinepress and the internet Plumas News version of all six papers. Laying Everything on the Line, Being Attacked by Environmentalists and Trolls and What Exactly Is Entailed in Defending Natural Places Like Genesee Valley? I am Adah Kauffman’s granddaughter. Earl and Adah lived one house down the road from yours. My family, parents, Toddy and Ray Johnson, and my sister and I often visited Ardis and Philip, and they visited the outdoor camp at the Kauffman’s place. As neighbors, we shared the beautiful Indian Creek canyon, as well as the entire Indian Valley, Genesee Valley, Antelope Valley, and knew the same Taylorsville characters. I am a great admirer of your father’s work and your mother’s loving presence. I just purchased first editions of “Range of Light” and “Drylands”, and my husband and I have spent many happy hours in the wilderness areas Philip photographed. I owe contact with you to my niece, Lisa Blade, who met with you at the Taylorsville Rodeo this year. Your articles on the environmentalists interest me a lot. Here in Sonoma County, I associate with the Sonoma Land Trust, who quietly acquire and maintain property sold to them by ranchers, as well as pure wilderness, often as wildlife corridors. The people at SLT take great pains to enroll the community in supporting their work, and I have met nobody who has objections. I plan to share your articles with some of my neighbors. Also, thank you for your beautiful photo essay and articles about sustainable agriculture in the midwest. Hello Louise, Thank you much for your comment. This Fall and Winter have been a whirlwind and I meant to reply sooner, but somehow overlooked doing so. I have very fond memories, especially of your mother Toddy, who my parents and I adored and who I remember very well. We had numerous dinners and other occasions together. My memories of Adah are hazier, but I do distinctly remember my parents getting me up in the middle of the night when I was four in 1969 for the first manned moon landing. Dad carried me over his shoulder in my pajamas down to the Kauffman’s, the nearest TV, to see the momentous event. Great that you were able to find copies of both the Range of Light and Drylands. I enjoyed meeting Randy and Lisa Blade this summer, but regret having missed them at the house a couple of times when they tried to stop by. There was a lot going on that week. My feature blog post articles about conservation and the modern environmental movement will continue off and on here. Despite being critical of environmentalists at times, I will always honor my father and his successful efforts playing a central role in the birth and development of the land conservation ethic. I too am involved in my local land trust here in Plumas County, called the Feather River Land Trust. One project of theirs for which I am part of the Management Group and committee is the historic Olsen Barn property in Chester, California on the shores of Lake Almanor and on the edge of the once thriving Maidu community of Big Meadows. We are restoring the barn and I am spearheading the sub-committee looking into the process of nominating the property for listing on the National Register of Historic Places. Because science shows that industrial agriculture is the number one contributor to climate change, while science also shows that small, sustainable agriculture is the most effective way of counteracting the ills of industrial agriculture, these subjects also will be the focus of future blog articles here. Thank you for your interest. Following up on the comment about Big Meadows: I am building a collaborative genealogy that is attempting to help consolidate Maidu heritage. It is best accessed through: https://www.geni.com/projects/Maidu-Native-American-tribe/people/51332 . I hope to read more of you great posts. Best of fortune with all the projects!